getting excited for hot peppers! I did some raised beds with garden soil hauled in this year. well, I put the peppers in there and they're doing great it seems! tons of flowers and I think that the first flower has a baby pepper!!! in the past, I barely get flowers and when I do, they don't really do anything. last year I got 1 pepper out of 6 plants. yeah. so I'm excited! I know my native soil is garbage, and no matter what I do to it, it just wont grow certain things... like radishes. won't grow them. period. not sure why. planted some in the kids garden this year and his grew radishes just fine. put some in my garden to try for the 6th year and nope. no radishes! Way to go! I remember how distressed you were last year. Clearly, this will be your pepper year. We had a really bad hail here last week. It defoliated almost everything but the HBC II's, which are in a bed located in the "L" of the house. They suffered some damage, the odd broken branch and some savaged leaves, but nothing serious. 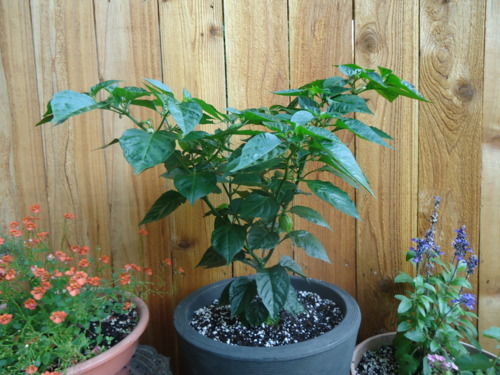 The Habaneros, however, are just twigs perched atop a wreck of shredded leaves. They are starting to come back, but they are set back about two or three weeks so might not be able to produce for me this year. I love watching peppers grow! I would have been devastated if the HBC II's had been lost. Best of luck with your guys! oh no! that is terrible! glad some are ok though! phew! My Anahiem has peppers and flowers galore, but my sweet pepper drops it's blossoms before they open. Why is this? They are both in containers (not together) and get exactly the same attention. I have a few more peppers now! this is going to be THE YEAR!!! It was a great year for peppers for me (knock on wood). I had one harvest 2 weeks ago and I'm seeing many new blossoms. And these were from seed, not transplants. I had a bajillion habaneros last summer from 1 plant! You are so lucky, I'm jealous! I have had nothing but bad luck with pepper plants last year, and even this year in terms of sprouting. I have one I started from seed that I'm nursing along, and seems to be growing bigger but not producing anything, and another one I bought from the store that has one small golf ball sized pepper, but I'm not sure if it'll ever go bigger~! there are lots more showing up now and I'm SO excited! who grew the numex big jim? how do I know when they're ready to pick? sheeshshe wrote: there are lots more showing up now and I'm SO excited! The numex big Jims turn red. Mine started going red at the top and worked their way down to the bottom. Once they're completely red, you can pick them. Unless, of course, you want to eat them green, in which case you just wait for a couple of weeks after the peppers have quit growing. I am so bummed. 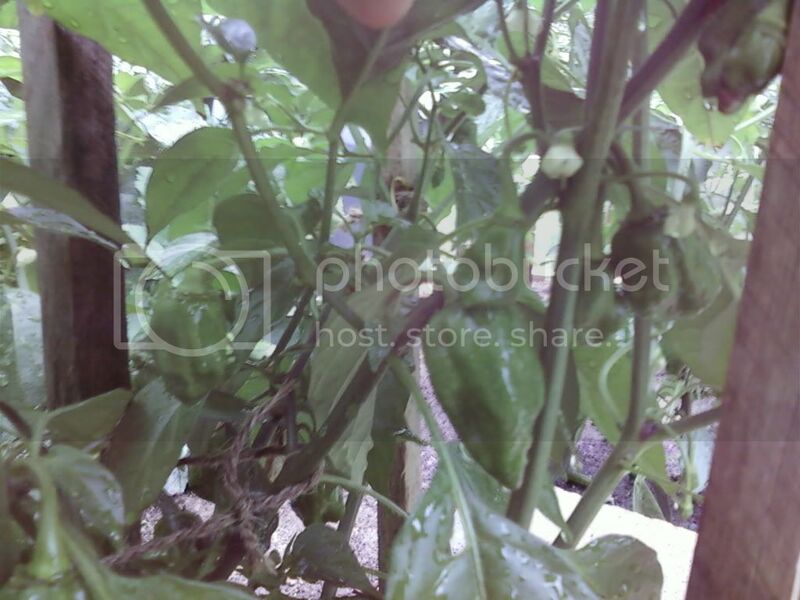 I checked my HBC II peppers yesterday, the ones I said had survived the bad hail storm. They got badly beaten up and are now starting to turn spongey. Completely unexpected. I am starting from scratch, fruit-wise, keeping my eye out for the next plant to decide to produce. These are a long-season pepper, and I'm betting they won't have time to completely mature, again! oh FUN! red! weee! LOL! hopefully there is enough time in the season for them to grow and then change color! I hope I hope! that is terrible I hope you get peppers! I hope I do too LOL! hopefully one of us will get peppers! My pepper plants are also doing well. 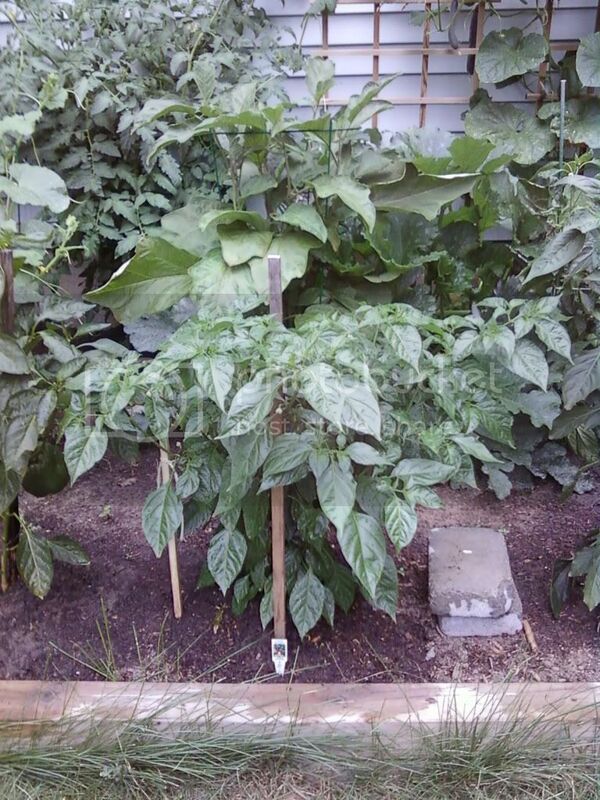 I planted 32 kinds of hot peppers (one plant each) and 28 sweet peppers (six varieties). 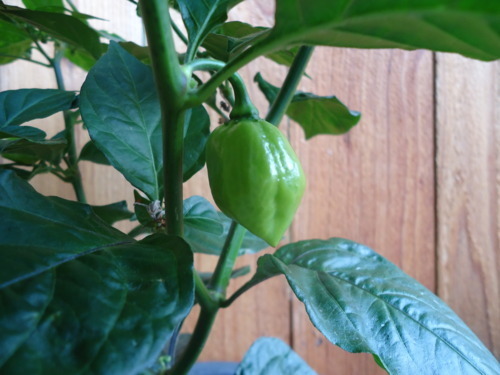 Many are loaded with peppers although the red caribbean, scotch bonnet and several other habanero types have blossoms but no fruit yet. I'm not sure what I'm going to do with all these peppers. I usually make several hundred jars of salsa, chili sauce and Indian relish but that will not happen this year. My tomato crop is a disaster. Many of the plants have early blight and have had it since mid June so the tomato harvest will be abysmal. It's quite normal for us to have early blight but it usually happens in August. Unfortunately, this past May and June were quite miserable here in Vermont so we have to suffer the consequences. SAME thing here with the early blight. it came super early this year for us as well. so far I "think" I finally have it under control. I loathe spraying because I like to be organic.... but I ended up spraying bc I just can't see losing 50 tomato plants. so I'm hopeful for salsa! i was hopeful for ghost peppers this year, even went so far as to think i was getting pretty good at this gardening thing. then pepper pods started coming. these aren't ghost peppers. next year i will put a little more effort in to ordering seeds.